The countdown is on for Felix Baumgartner’s jump from the stratosphere. Red Bull Stratos reports that the space capsule Baumgartner will used has passed high-altitude simulation testing after it was damaged in July’s final practice jump, and a launch date has been set for October 8 in Roswell, New Mexico. Baumgartner will leap from the edge of space, attempting to not only break the sound barrier with his body, but also break the record for the longest freefall. As no one has successfully jumped from this height before, it’s uncertain what the highest supersonic freefall in history will look or feel like. The animated video below, provides a sense of what to expect during the attempt. 43-year-old Baumgartner is hoping to jump from nearly 37 km (23 miles, 120,000 feet) to break the current jump record held by Joe Kittinger a retired Air Force officer, who jumped from 31,500 meters (31.5 km, 19.5 miles, 102,000 ft) in 1960. Now 83, Kittinger is assisting Baumgartner in preparations for the jump. Baumgartner said he is delighted that “go” has been given for the attempt. “I feel like a tiger in a cage waiting to get out,” said Baumgartner, a B.A.S.E. jumpers and extreme athletes, who in 2003 became the first person to make a freefall flight across the English Channel with the aid of a carbon wing. He will be flying as fast as speeding bullet during his supersonic journey to Earth. The Red Bull Stratos team is trying to involve the public as much as possible. They will webcast the freefall attempt, and there’s even a contest to estimate where Baumgartner will land. 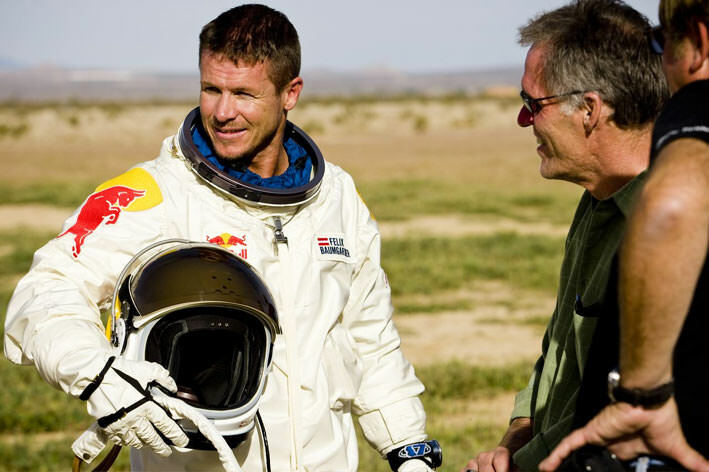 Baumgartner and the Red Bull Stratos team have been preparing for years to break the record for highest-altitude jump. The capsule, which at about 1.315 kilograms (2,899 pounds) weighs a little bit more than a VW Beetle, was damaged in a hard landing following Baumgartner’s final test jump from a near-record altitude of 29,610 meters (97,146 feet) in July – during the jump Baumgartner was freefalling at speeds of up to 536 mph / 864 kilometers per hour, or as fast as a commercial airliner. The Austrian landed safely in another part of the New Mexico desert. Red Bull Stratos says the central aim of the project is to collect valuable data for science that could ultimately help improve the safety of space travel and enable high-altitude escapes from spacecraft. The jump will also attempt to break an assortment of records such as highest speed in freefall, highest jump, highest manned balloon flight and longest freefall. Austrian skydiver Felix Baumgartner took a practice jump today, (July 25, 2012) to help him prepare for his leap from the edge of space later this year where he hopes to not only break the sound barrier with his body, but also break the record for the longest freefall. In preparation for his Red Bull Stratos mission, Baumgartner rode his specially-made pressurized capsule via a helium balloon and jumped from an altitude of over 29,455 meters (96,640 feet), falling for 3 minutes, 48 seconds, reaching speeds of 862 km/h (536 mph). According to Red Bull Stratos team, this is the final milestone before his attempt of jumping from 36,500 meters (120,000 feet), to break the current jump record held by Joe Kittinger a retired Air Force officer – and Baumgartner’s current adviser and mentor — who jumped from 31,500 m (31.5 km, 19.5 miles) in 1960. 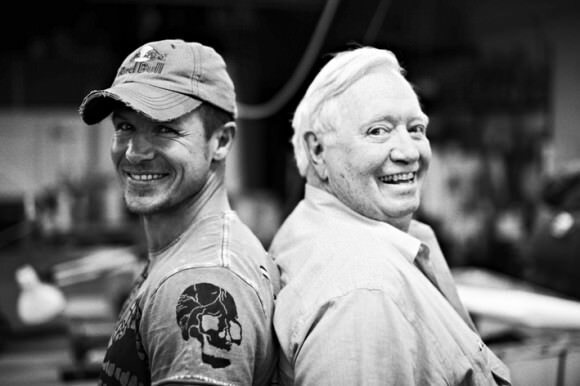 Caption: Technical Project Director Art Thompson and Capcom 1 USAF Col Joe Kittinger of the United States welcome Pilot Felix Baumgartner of Austria during the second manned test flight for Red Bull Stratos in Roswell, New Mexico, USA on July 25, 2012. Credit: Red Bull Stratos. Today’s test launch was twice delayed due to bad weather, but the Red Bull team said they were never discouraged, well aware that even Space Shuttle launches sometimes faced several days of postponement. Caption: Pilot Felix Baumgartner of Austria celebrates after he lands at the desert during the second manned test flight for Red Bull Stratos. Credit: Red Bull Stratos. The balloon took about 90 minutes to reach the desired altitude, and after the freefall, he floated down on his parachute for about eight minutes. Baumgartner landed in the New Mexico desert, just about 15 minutes by helicopter from his launch site at Roswell International Air Center. Today’s successful test, with a balloon over four times as large as the one that carried Baumgartner for the first test flight in March, provided more insights for the progress of the project and also new data for the benefit of aerospace research, the team said. Red Bull Stratos did not provide an official date for the record-setting attempt, but only said it is now subject to favorable weather conditions and critical post-jump assessments of the capsule and equipment. Want to know what it is like to bail out in near space and freefall 37 km (23 miles) to Earth? You’re about to find out. While no date has been announced yet for Felix Baumgartner’s attempt at breaking the speed of sound during freefall, when it does occur, everyone will be able to watch. The Red Bull Stratos mission team announced today there will be a live television broadcast and online stream of the activities. In-flight cameras will be mounted on the capsule that brings him to 36,500 meters (120,000 feet) altitude via stratospheric balloon, as well as on Baumgartner’s space suit. If successful, this will be the first time in history a freefalling human body will reach supersonic speeds. There will also be microphones inside the capsule and inside Baumgartner’s helmet. Those on the capsule will record sound only as long as there is air to carry the soundwaves. When Baumgartner depressurizes the capsule (just before he jumps), those ambient microphones in the capsule will stop picking up sound, but his helmet mic should keep working. The final launch date, location and live stream details will be announced in the coming weeks on www.redbullstratos.com, on Twitter (@RedBullStratos), and on Facebook. The current record-holder, USAF Col. (Ret.) Joe Kittinger jumped from 102,800 feet 50 years ago this month. He did not break the speed of sound, although he probably came close. There have been several attempts to surpass Kittinger’s record, but none have succeeded, and people have given their lives for the quest. There are some movies and images from Kittinger’s jump, and his team used spring-wound motion picture cameras warmed by hot-water bottles to document his freefall. 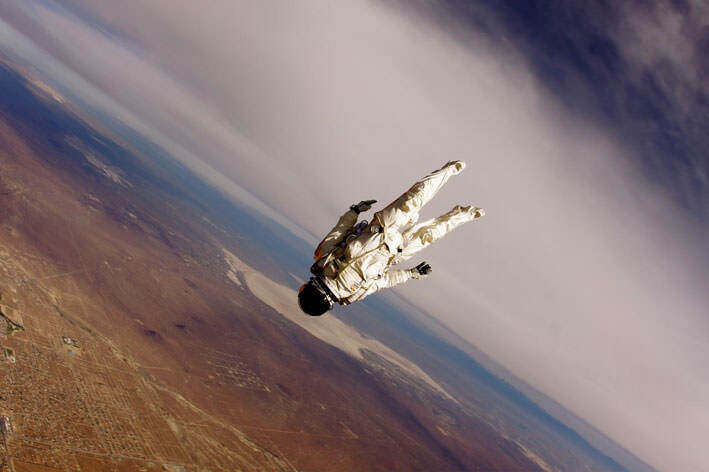 Red Bull Stratos will use high-definition video cameras and ultra-high-definition 4K digital cinematography cameras. The challenge will be keeping them cool in an environment where the air is too thin to wick away their heat. And of course there is the main reason to record everything that happens in the jump: for the benefit of scientific research. We’ll provide an update on the date of the Baumgartner’s jump when it is announced. Read our preview article on Baumgartner’s record-breaking attempt. Back in 1960, a US Air Force captain named Joe Kittinger made aerospace history by making a jump from 31,000 meters (102,800 feet). His jump contributed valuable data that provided ground work for spacesuit technology and knowledge about human physiology for the US space program. There have been several attempts to surpass Kittinger’s record, but none have succeeded, and people have given their lives for the quest. Sometime during 2010, Baumgartner will make an attempt in his “Red Bull Stratos” mission — named after the energy drink company that co-created the program with the Austrian skydiver. Red Bull Stratos team members say the mission will explore the limits of the human body in one of the most hostile environments known to humankind, in the attempt to deliver valuable lessons in human endurance and high-altitude technology. While there is no literal “barrier,”the transition to supersonic speeds can cause problems for aircraft as transonic air movement creates disruptive shock waves and turbulence. Data obtained from Chuck Yeager’s first supersonic flight in 1947 allowed for changes in design of supersonic aircraft to avoid problems. Still, some aircraft still experience problems, and going supersonic has been attributed to some air disasters. Documents provided by the Red Bull Stratos mission say that the data obtained from the mission will be shared with the scientific community, and Clark notes that he expects long-awaited medical protocols to be established as a result. That’s why his spacesuit is so important. The suit Baumgartner will use is custom-made for him, so there should be no pressure points caused by the suit that would make him uncomfortable, but any pressure suit restricts mobility and dexterity. He will have to avoid movements that could cause him to go into an uncontrollable spin. Baumgartner is not new to jumping. He owns several world records for B.A.S.E. jumping and is well known for skydiving across the English Channel in 2003. He is also a parachutist, stunt coordinator and a commercial helicopter pilot. This will definitely be an attempt to go where no one has gone before. For more information on the mission, visit the Red Bull Stratos website, or Felix Baumgartner’s website.